Zinc 1 mg/mL (Zinc Chloride Injection, USP) is a sterile, nonpyrogenic solution intended for use as an additive to intravenous solutions for total parenteral nutrition (TPN). Each mL of solution contains 2.09 mg zinc chloride and 9 mg sodium chloride. The solution contains no bacteriostat, antimicrobial agent or added buffer. The pH is 2.0 (1.5 to 2.5); product may contain hydrochloric acid and sodium hydroxide for pH adjustment. The osmolarity is 0.354 mOsmoL/mL (calc.). Zinc Chloride, USP is chemically designated ZnCl2, a white crystalline compound freely soluble in water. Zinc is an essential nutritional requirement and serves as a cofactor for more than 70 different enzymes including carbonic anhydrase, alkaline phosphatase, lactic dehydrogenase, and both RNA and DNA polymerase. Zinc facilitates wound healing, helps maintain normal growth rates, normal skin hydration, and the senses of taste and smell. Zinc resides in muscle, bone, skin, kidney, liver, pancreas, retina, prostate and particularly in the red and white blood cells. Zinc binds to plasma albumin, Î±2-macroglobulin, and some plasma amino acids including histidine, cysteine, threonine, glycine, and asparagine. Ingested zinc is excreted mainly in the stool (approximately 90%), and to a lesser extent in the urine and in perspiration. Providing zinc helps prevent development of deficiency symptoms such as: Parakeratosis, hypogeusia, anorexia, dysosmia, geophagia, hypogonadism, growth retardation and hepatosplenomegaly. The initial manifestations of hypozincemia in TPN are diarrhea, apathy and depression. At plasma levels below 20 mcg zinc/100 mL dermatitis followed by alopecia has been reported for TPN patients. Normal zinc plasma levels are 100 ± 12 mcg/100 mL. Zinc 1 mg/mL (Zinc Chloride Injection, USP) is indicated for use as a supplement to intravenous solutions given for TPN. Administration helps to maintain zinc serum levels and to prevent depletion of endogenous stores, and subsequent deficiency symptoms. Direct intramuscular or intravenous injection of Zinc 1 mg/mL (Zinc Chloride Injection, USP) is contraindicated as the acidic pH of the solution (2) may cause considerable tissue irritation. Severe kidney disease may make it necessary to reduce or omit chromium and zinc doses because these elements are primarily eliminated in the urine. Zinc 1 mg/mL (Zinc Chloride Injection, USP) should only be used in conjunction with a pharmacy directed admixture program using aseptic technique in a laminar flow environment; it should be used promptly and in a single operation without any repeated penetrations. Solution contains no preservatives; discard unused portion immediately after admixture procedure is completed. Zinc should not be given undiluted by direct injection into a peripheral vein because of the likelihood of infusion phlebitis and the potential for increased excretory loss of zinc from a bolus injection. Administration of zinc in the absence of copper may cause a decrease in serum copper levels. Periodic determinations of serum copper as well as zinc are suggested as a guideline for subsequent zinc administration. Long-term animal studies to evaluate the carcinogenic potential of Zinc 1 mg/mL (Zinc Chloride Injection, USP) have not been performed, nor have studies been done to assess mutagenesis or impairment of fertility. It is not known whether this drug is excreted in human milk. Because many drugs are excreted in human milk, caution should be exercised when Zinc 1 mg/mL (Zinc Chloride Injection, USP) is administered to a nursing woman. Animal reproduction studies have not been conducted with zinc chloride. It is also not known whether zinc chloride can cause fetal harm when administered to a pregnant woman or can affect reproduction capacity. Zinc chloride should be given to a pregnant woman only if clearly needed. Single intravenous doses of 1 to 2 mg zinc/kg body weight have been given to adult leukemic patients without toxic manifestations. However, acute toxicity was reported in an adult when 10 mg zinc was infused over a period of one hour on each of four consecutive days. Profuse sweating, decreased level of consciousness, blurred vision, tachycardia (140/min), and marked hypothermia (94.2° F) on the fourth day were accompanied by a serum zinc concentration of 207 mcg/dl. Symptoms abated within three hours. Hyperamylasemia may be a sign of impending zinc overdosage; patients receiving an inadvertent overdose (25 mg zinc/liter of TPN solution, equivalent to 50 to 70 mg zinc/day) developed hyperamylasemia (557 to 1850 Klein units; normal: 130 to 310). Death resulted from an overdosage in which 1683 mg zinc was delivered intravenously over the course of 60 hours to a 72 year old patient. Symptoms of zinc toxicity included hypotension (80/40 mm Hg), pulmonary edema, diarrhea, vomiting, jaundice, and oliguria, with a serum zinc level of 4184 mcg/dl. Calcium supplements may confer a protective effect against zinc toxicity. 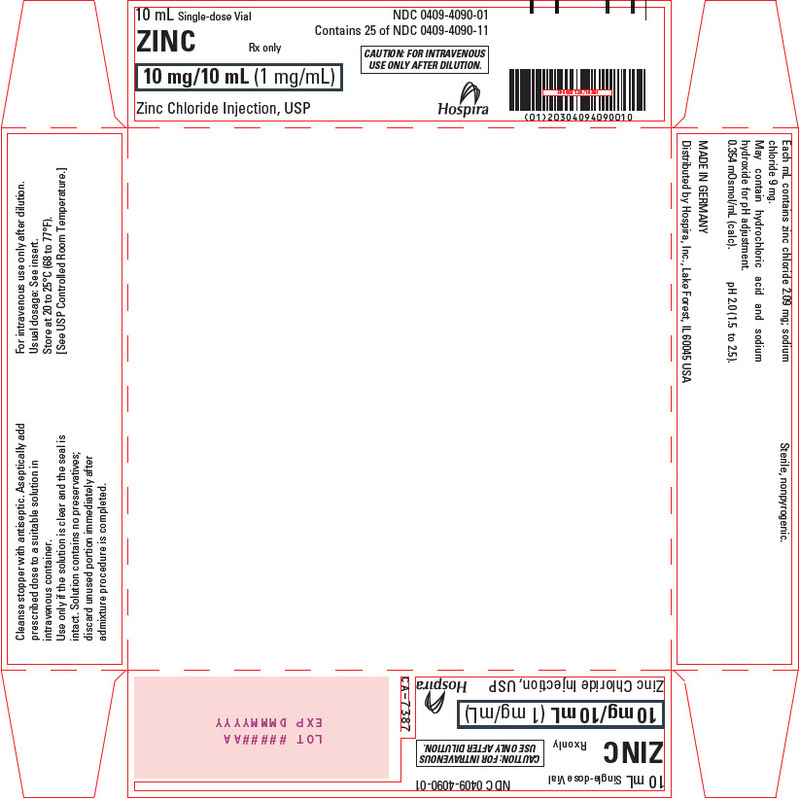 Zinc 1 mg/mL (Zinc Chloride Injection, USP) contains 1 mg zinc/mL and is administered intravenously only after dilution. The additive should be diluted prior to administration in a volume of fluid not less than 100 mL. For the metabolically stable adult receiving TPN, the suggested intravenous dosage is 2.5 to 4 mg zinc/day (2.5 to 4 mL/day). An additional 2 mg zinc/day (2 mL/day) is suggested for acute catabolic states. For the stable adult with fluid loss from the small bowel, an additional 12.2 mg zinc/liter of small bowel fluid lost (12.2 mL/liter of small bowel fluid lost), or an additional 17.1 mg zinc/kg of stool or ileostomy output (17.1 mL/kg of stool or ileostomy output) is recommended. Frequent monitoring of zinc blood levels is suggested for patients receiving more than the usual maintenance dosage level of zinc. Parenteral drug products should be inspected visually for particulate matter and discoloration prior to administration, whenever solution and container permit. (See PRECAUTIONS.). Zinc 1 mg/mL (Zinc Chloride Injection, USP) is supplied in 10 mL Plastic Vials.